For something as seemingly easy as meatballs, I sure had a heck of a time putting together this meal. 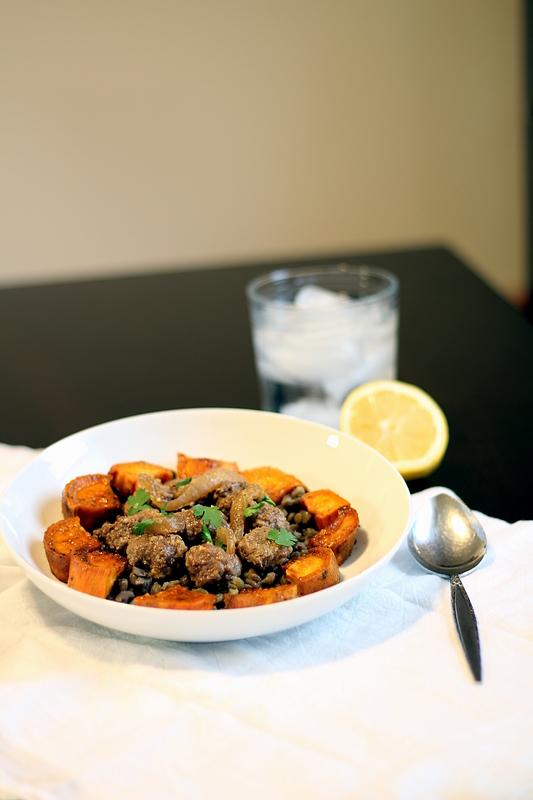 None of the individual components are really all that complicated – it’s basically meatballs, some roasted red sweet potato, and brown lentils. Easy, right? Well, it really should have been, except that my regular grocery store has been totally screwing me over lately by selling me bad produce. You’d think that I would be able to pick out good, non-rotting onions and red sweet potatoes but evidently NOT. I really try my best to cook with as many fresh ingredients as I can get my hands on. You’ll very rarely see my recipes call for cans of anything or “cream of” anything, so I get pretty frustrated when I buy an onion and two red sweet potatoes on a Sunday and by Tuesday the onion is half moldy and one of the two red sweet potatoes practically dissolves in my hand when I pick it up. I bought the two sweet potatoes the exact same way! I picked them each up, gave them a little squeeze, and placed them in my cart. How is it that one of them can just go completely rotten in the span of 48 hours. Damn you, un-named chain grocery store near my house! So I had been planning to make these meatballs (which call for one WHOLE onion, not half of an onion salvaged from a ball of moldy mess) along with a red sweet potato puree made with coconut milk. Sounds awesome, RIGHT? Well since I only found myself with ONE red sweet potato instead of two, I didn’t quite have enough to justify the work of a puree, so I chopped it up and roasted it instead. I tried to peel it, but I guess red sweet potatoes don’t like to be peeled. Sooo I left the peel on and it was delicious that way anyhow. If you enjoy being frustrated, feel free to try to peel yours. I roasted it with some oil, spices, and apple cider vinegar and it was absolutely delicious. Honestly, probably better than the puree would have been. Since I didn’t have a ton of sweet potatoes and I wanted to actually satisfy my hunger with this meal, I decided to make some brown lentils to bulk it up a bit. This also ended up being an awesome idea, because the lentils soaked up all sorts of delicious drippings from the onions and meatballs. In short, what started as a big failed project ended up being a truly delicious dinner. It was hearty, flavorful, and full of texture and color. Hooray! Peel and roughly chop the small onion. Place the pieces in a food processor and process until finely minced. Place 1 tsp. of salt over the onions and set aside to let them spit out their excess water for about 5-10 minutes. In a medium bowl, place the ground beef, egg, 1/2 tsp. salt, cinnamon, allspice and cumin. Once the onions have spit out their water, drain them and add them to the bowl. Mix with your hands until all is well incorporated. Form into marble-sized meatballs (have patience, young Jedi!) and place on a greased wire rack atop a baking sheet. Bake at 350 degrees for 5-7 minutes or until brown in color. Meanwhile, heat a large skillet over medium heat and add the olive oil. Slice your large onion in thick rings and brown them in the pan until they are translucent, about 3-5 minutes. Once the meatballs are out the oven, toss them into the pan with the onions and add the broth and tomato paste. Stir well and let the mixture come to a boil. Reduce to a simmer and let the mixture cook for 15-20 minutes until thickened. Remove from heat and add the juice from half a lemon. 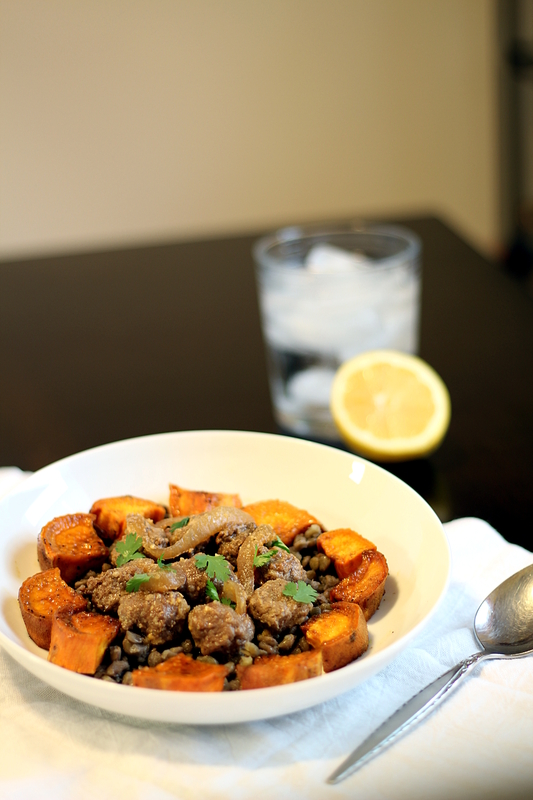 Serve with lentils and roasted sweet potatoes (recipe below)! 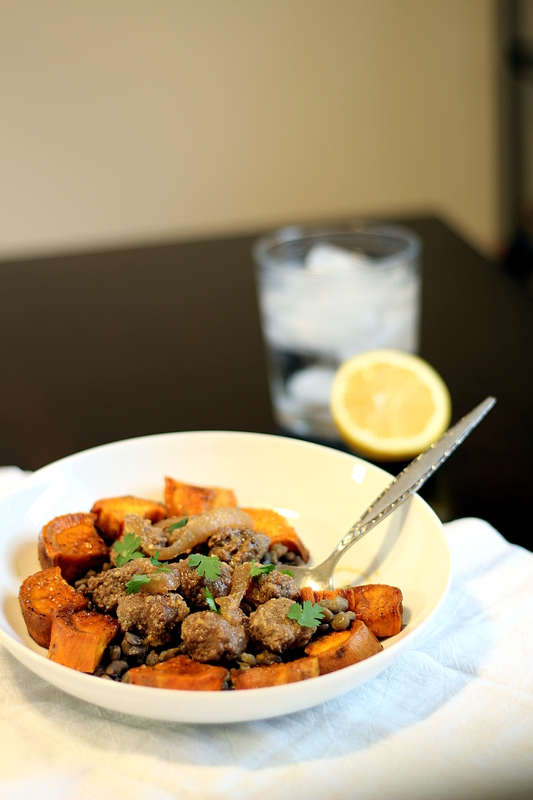 In a large bowl, combine the diced sweet potato, oil, vinegar, brown sugar, salt, cumin, and curry powder. Toss to combine. Spread in a single layer on a 9 x 13 ” baking sheet. Bake for 15 minutes. Toss, return to oven, and continue baking for another 10-15 minutes or until the sweet potatoes are able to be cut with a fork.